Description: These simple but lovely invitations are 5" x 7" and printed on our premium crafted, smooth white paper, your personalization is featured in the raised ink color of your choice. (Azure, harbor, navy, persian blue, sapphire, sky, sage, teal, olive, hunter, lime, clover, copper, gold, silver, smoke, taupe, sable, black, coral, tanterine, lilac, plum, raisin, orchid, pink, raspberry, maroon or cherry. White envelopes are included, but you may upgrade to a colored (kraft, green, yellow, red, camellia, teal, atlantis, or peacock) envelope. Envelope linings are also available. 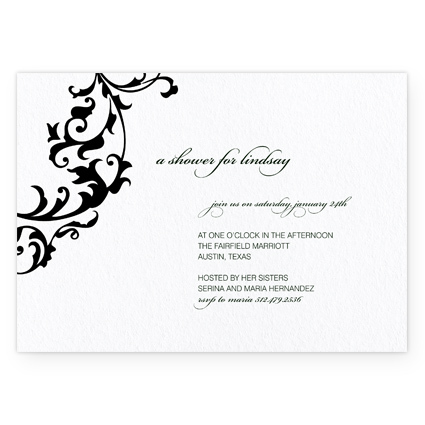 These invitations are stylish and affordably priced!